If the thought of scheduling this year’s Parent Teacher Conferences brings up something that feels like a cousin to Post Traumatic Stress Disorder, we have great news: SignUp.com brings you hassle-free scheduling with free, online Parent Teacher Conference SignUps, automated reminders and real time eCalendar syncing. That’s right--no more sending out mass emails. No more physical notes tucked into your students’ backpacks. No more follow-up telephone calls. No more clipboard sign up sheets with names and times that need to be entered into a spreadsheet by hand. Online SignUps from SignUp.com has taken the stress out of scheduling parent teacher conferences, leaving you the opportunity to focus on the conferences themselves. 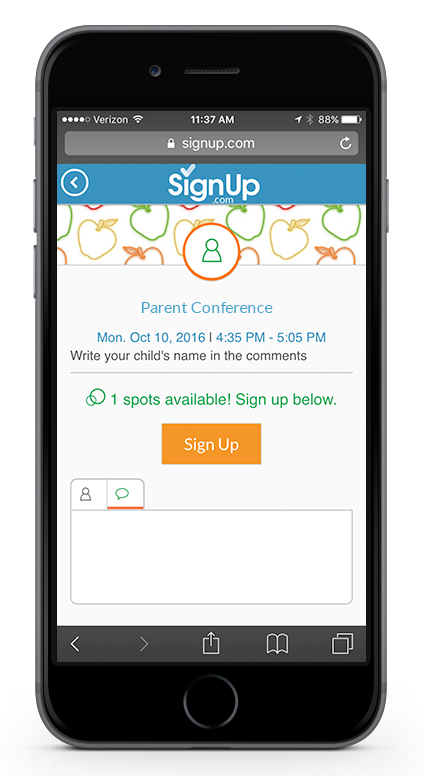 Parents can sign up with a few taps from their mobile devices, and will receive automated reminder notifications, as well as real time eCalendar syncing. Teachers can invite class parents with a personal email invitation from SignUp.com or with a sharable URL link button in a class e-newsletter, web page, or on Facebook! Parent-Teacher Conference SignUps for Parents: Parents can easily see the available conference times and sign up from their mobile devices or computers. If changes need to be made, parents can do it online easily and simply with a few keystrokes. 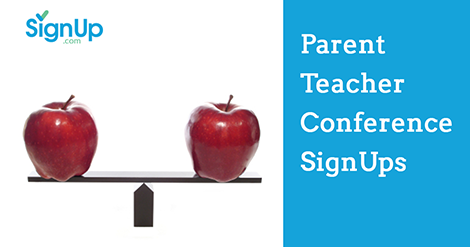 It’s time to return Parent/Teacher conferences to their original focus: determining how students are doing in class and how to make this school year the most successful one yet. By removing the stress of the scheduling, you’ll save time and trouble and get to concentrate on what’s really important! Get started today with fast, easy and free, online SignUp sheets for parent teacher conferences!